Well, we have a lot of catching up to do this Spring…The winter of 06/07 was one of the most devastating winters we have ever experienced here on the prairie of Eastern Colorado. Seven consecutive record breaking blizzards buried us for nearly three months. 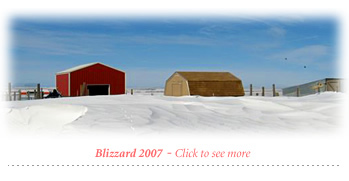 The blizzards wreaked havoc on all aspects of survival for us and the animals – our housing, our water supply our food supply… entire fences and buildings were buried under 10 foot drifts. The stress on the animals was severe despite our tireless efforts at keeping them safe and alive… and they were the lucky ones compared to all the other farmed animals who had no one to care whether they lived or died and whose lives were only measured as commodities. Local, State, Federal, and volunteer resources poured into the ranching and animal exploiting operations in Southeastern Colorado, with the only goal being to keep some animals alive long enough to endure the terrifying trip to the slaughterhouse and violent murder for the sale of their butchered bodies. Meanwhile, Peaceful Prairie struggled to find price gauged hay and feed for rescued victims of the egg, dairy and flesh industries. Thankfully we had the support of a few extremely generous donors and volunteers who helped us through a financially, physically, and emotionally difficult winter. To those of you who were so thoughtful supportive and generous – We thank you! The recovery will go well into the summer months and will cut even deeper into our very frugal operations budget. Although volunteer work is always helpful with barn cleaning and feed & supply stocking, we will have to hire professional builders for the barn repairs in order to provide the best structural quality and protection for the animals. Any monetary contributions to the rebuilding recovery will be greatly appreciated. The Peaceful Choices Billboard and website were seen by hundreds of thousands of Denverites and out of state visitors. The Peaceful Choices Billboard was prominently displayed at prime location for 3 months in Downtown Denver. 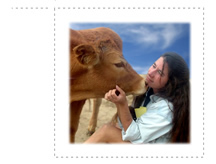 We launched the Billboard and Peaceful Choices website to coincide with the National Western Stock Show. The impact the billboard and website had on the public was quite profound. We received constant emails, phone calls and website hits thanks to the compelling message and imagery designed by our talented Board member, Joanna Lucas. Just when we think she’s outdone herself with all of the other creative and unique outreach work she does, she surprises again and again. To see even more of Joanna’s provocative and inspiring work, please be sure to check out the PPS Blog. You will be immersed in the complex and extraordinary lives of Peaceful Prairie’s residents in a way you have never experienced before – I guarantee it!